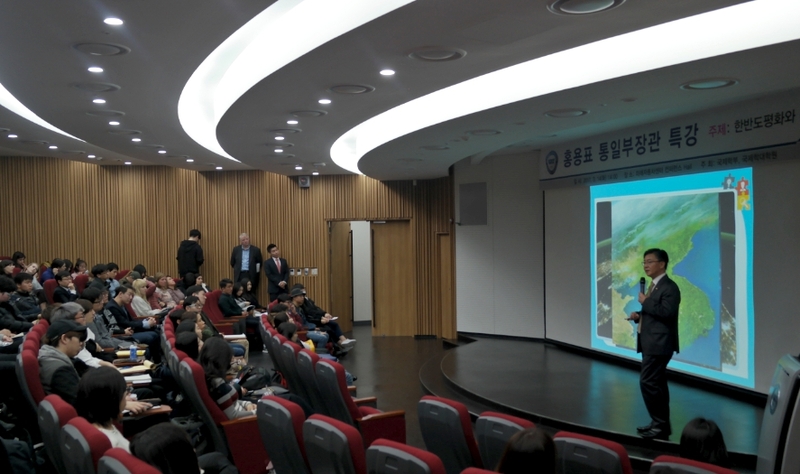 Minister of Unification YongPyo Hong visited Hanyang University on March 14 to present a special lecture under the title of “Peace and Unification of the Korean Peninsula.” The lecture was held in the Chung Mong-Koo Conference Hall. Minister Hong described unification as a means of healing the sickness of the country and noted that the nation is still fearful of war and separation. He also reported on the current state of affairs in North Korea and explained how the nuclear weapons issue continues to divide the peninsula. During the lecture, he repeatedly emphasized the importance of unification for alleviating the crisis among the North East Asian countries and supporting world peace. After the lecture, the minister had a meaningful Q&A session in which he answered questions from both Korean and international students. Minister Hong is currently a professor in the Department of Political Science and International Studies at Hanyang University.